During record-low temperatures in 2009, Sean Murphy ’11 struggled to concentrate while transcribing notes from his small field notebook to computer when his Structural Geology class traveled to Sheep Mountain, Wyoming. Tyrus White ’15 and Chris Pelland ’15 record their measurements. 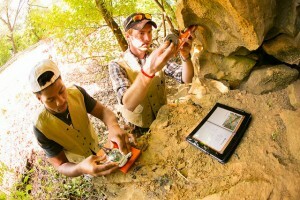 Thanks to an innovative collaboration among geology and computer science faculty and students, there are two: GeoFieldBook and StratLogger. 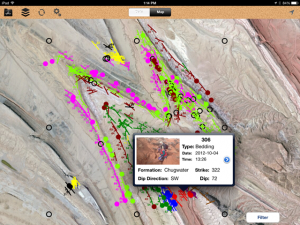 Students use the companion apps in the two-course sequence Structural Geology and Sedimentology/Stratigraphy, taught respectively by Lawrence Malinconico and David Sunderlin, associate professors of geology and environmental geosciences. The apps have made a world of difference for students, not only in their ease of use but also in ensuring more efficient and precise data collection. Geology major Christine Almer ’16 (Whitehouse, New Jersey) called GeoFieldBook a “lifesaver” during a trip last year to Sheep Mountain, a barren and craggy outpost 13 miles southwest of Jackson Hole with exposed rocks ranging in age from 70 to 250 million years old. There, students were tasked with measuring a one-and-a-half-square-mile field area and carried iPads with the app to record their measurements. The data is eventually used to construct geologic maps that enable a deeper understanding of how landscapes of ancient Earth were formed. 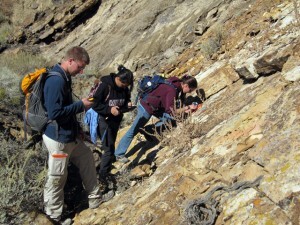 Students use the app in Sheep Mountain, Wyoming, during the Structural Geology class. But before they can talk the geologic talk, students have to pull on their boots and walk the site area collecting and interpreting structural measurements and location coordinates. The app’s pop-up questions and prompts helped the team critically evaluate the fieldwork and their hypotheses while also making sure that they had all the information they needed before moving on to the next collection point, says Caroline Ladlow ’16 (Lancaster, Pennsylvania). Being able to view how much of the area was already mapped also helped students strategize for the next day’s data collection, says geology major Alexandra Nagurney ’16 (Amherst, Massachusetts). That is exactly the point, says Chun Wai Liew, associate professor of computer science, who led a team of students in developing the apps. Computer science major Lucy McKnight ’16 (Felton, Pennsylvania) added new features to GeoFieldBook and developed StratLogger through the EXCEL Scholars undergraduate research program. Having one app provides students with all the tools they need, such as Google Earth, maps, spreadsheets, etc., in one place and allows data to be shared among tools via the cloud. Nick Andrews ’16, Professor Larry Malinconico, and Allie Nagurney ’16 use the app to record their data. The apps also help professors understand what issues or difficulties students encounter when applying classroom concepts in the field. Malinconico points out that there is other professional grade software that does the same thing as GeoFieldBook and StratLogger, but they have steep learning curves. The apps developed at Lafayette are competitive educational alternatives. Murphy, who had to rely on meticulous note taking at Sheep Mountain in 2009, is now an exploration geologist for Southwestern Energy Company in Houston, having earned a master’s degree in subsurface geosciences at Rice University. He gave high marks to the software the students’ created, saying it was similar to what he uses on a day-to-day basis. The photograph linking to this article from the Lafayette homepage was taken by Robyn Henderek ’15. I enjoyed your presentation on this the GeoFieldBook app at SE GSA in Blacksburg, VA but I cannot find it in the App Store. 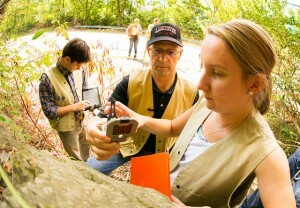 See news story on geology app at Lafayette.